Dealing with Guilt After the Death of a Beloved Pet — Hey Eleanor! I'm a huge dog lover and desperately wanted to adopt a pup. I traveled regularly for work, lived in a condo (on the 15th floor) that didn't allow dogs and also, I was 25-years-old. Dog = bad choice, so a friend suggested I get a cat. But many a trusted person told me cats are actually pretty great and affectionate. In a moment of weakness, I thought about it and eventually decided, ah what the hell. There's an adoption event at PetCo. I'll just go and look. She was so sweet and perfect and probably didn't even smell like most of the other cats I'd met. I threw caution to the wind and told the adoption lady, "I'll take the white one!" She smiled politely and said, "Sure, but we are only adopting kittens from that litter in pairs." I wanted the white one like crazy. Somebody at the adoption event casually mentioned that two cats are better than one because they play and keep each other company. Long story short, that's how I ended up with Olive and Bogart. Every morning, she'd follow me like a white shadow from bed, to the shower, to my closet, to the breakfast table. She knew her name and would come when I called. She slept next to me every night. She snuggled by me while I pulled all nighters for work. She was there to help mend broken hearts, kept me company during the two years I lived alone, and gave me the thumbs up when I fell in love with Josh. 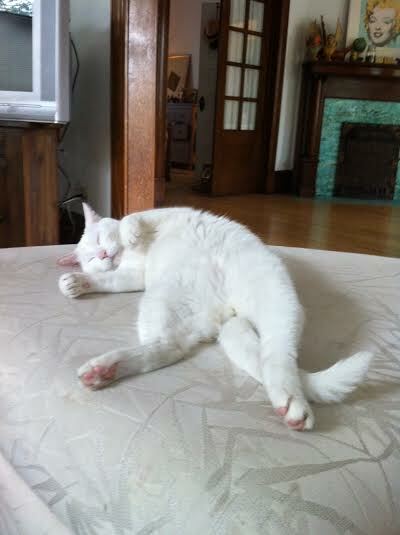 My other cat Bogart was there for all of that, too (and he is, in fact, an awesome cat)… but Olive was my sweetheart. Three years ago, I brought both of the cats in for a routine check up. The vet ran some tests and determined Olive was born with itty-bitty kidneys. The vet suggested I put her on some special (and $$$$!) cat food and medicine to "help maintain her quality of life, and possibly prolong it a few more years." I wrapped her up in an orange hand towel and we headed to an animal ER (yes, they do exist). The vet took one look at her and said, "That's a very sick kitty." Apparently, she was in renal failure. Her body temperature was 10 degrees below normal. Her kidney values were off the charts and she was severely dehydrated. We all agreed that Olive should stay overnight, but it didn't look good. How long had I ignored her symptoms? Why didn't we have someone check on the cats while we were away? Why had I waited to schedule their regular check-up (bringing them to the vet had been on my to-do list for a month!)? I couldn't help but feel like I'd let my bestie down. That's no life for a kitty. And here's when I faced one of my biggest fears of all: Crying in public (#71). In fact, the only person I feel safe crying in front of is Josh. Some people cry so gracefully-- blinking away a tear or two in silence. Not I. I hold back the waterworks until I can no longer take it, and then it's guttural, loud, black mascara mess. The following week, I couldn't stop thinking about what I could've done differently. I was consumed by it, and honestly felt really uncomfortable telling people, "I'm acting crazy because my cat died." I thought people would roll their eyes; there's a lot of "I'm not a cat person" persons out there. But when I finally womanned up and admitted my issue aloud (#73), no one tried to make me feel stupid or dramatic. Everyone got it, and many shared a story of a special pet they'd lost. 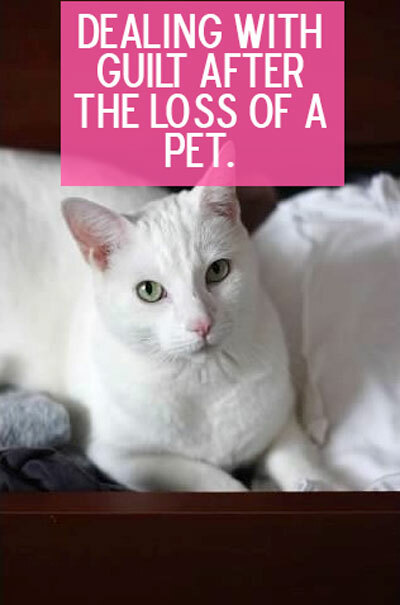 Knowing you'll probably outlive your pets is a big reason to not get one in the first place. They become a part of your family and saying goodbye is so hard. However, I can't even imagine my life without my four-legged kids. I will forever be indebted to their unconditional love and affection.